T2 Design was delighted to create a responsive and smokin’ hot website for some friendly folks at Rocky Top, Tennessee’s newest eatery. 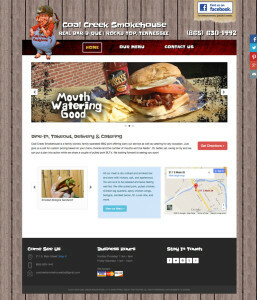 Coal Creek Smokehouse is a family-owned bar-b-que joint, with mouth-watering pulled pork, ribs, wings and savory side dishes. We were lucky enough to feast on all the fixin’s and let me tell you, it is worth a visit to Rocky Top! Need a responsive website or brochure for your new business? We’d love to help you out. What does responsive mean, you might ask? A responsive site automatically adjusts to look fantastic and work properly on all devices, from desktop computers, to tablets, to smart phones. Contact us today! T2 Design recently crafted a responsive web design for Omega Technical Services of Oak Ridge, Tennessee. A responsive website adapts to provide you with content that is easy to read and easy to navigate on multiple devices; including desktop monitors, tablets and smart phones. There is no need to spend additional time and money to create a separate mobile site with different dimensions and content to accommodate various devices. A responsive website does the work on it’s own by using fluid, proportion-based grids to ensure that the consumer has an optimal viewing experience when visiting your site, no matter what device they use. Want to discuss making the switch to a responsive web design? Give T2 Design a call today!